Are you looking for a top quality rod to hold up your shower curtains? There are countless suppliers online that claim to have the market’s highest quality rod in stock, but not all of them might suit your shower’s particular style. It doesn’t matter if your shower tiles are uneven, slippery or if you’re looking for a product capable of holding its own on rippled surfaces, we’re going to help you find exactly what you need. After going over a wide variety of shower rods, we’ve seen that the Tension Bathroom Shower Curtain Rod by Zenna Home should offer the most overall satisfaction to its buyers with its seemingly great set of features and benefits. Although most single rods tend to be more firm than its double-sided counterparts, making sure the rod is sturdy and won’t fall over within months or even days after its installation is one of the most sought after qualities when making a purchase. The product should remain steady in any surface of need, even in rippled surfaces or slippery tiles. Different shower sizes and types make having a versatile rod a very important quality. The rod should be able to be properly adjusted and fitted into most spaces without any sort of inconvenience. 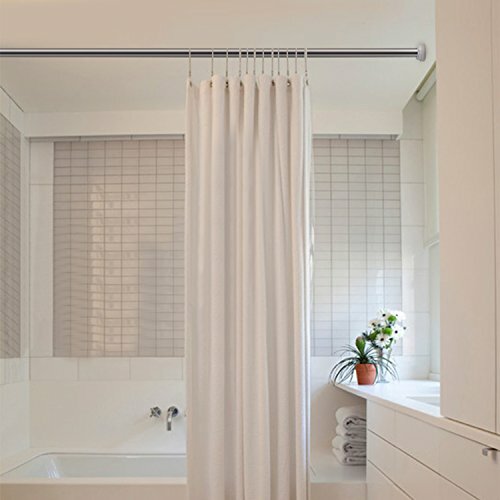 More often than not, versatile shower rods tend to have small lumps that could be annoying at the moment of sliding the curtain from one side to the other. This happens because of low-quality standards from companies that look over these issues, often found together with most rods with retractable features. This rod by Zenna Home seems really easy to install, as all it requires is for the owner to adjust it and twist the edges in order to make it fit the wall. It takes almost no time and leaves the wall intact, without any damage marks. It holds a decent amount of weight as well; it could easily be used to hang wet clothing. In some instance, there might be issues with the rod bending a bit when weight concentrates near the middle, but in general, the product should leave buyers pleased – mainly because of its affordable price. Keep in mind that in order to have it properly attached to the wall you’ll need to tighten the mechanism as much as you can, otherwise it could fall down. The curtains slide with little difficulty, but sometimes they could scratch the chromed material a bit – they should be handled carefully. Isn’t as expensive as other products found online. Although inexpensive, it doesn’t look like a cheap craft. Easy install. Although tightening the rod could prove to be a tedious process, once set up it should hold a decent amount of weight. It could bend if too much weight is concentrated near the center. Tightening the rod during installation might feel tedious. The rod is prone to scratches from common wear and tear. 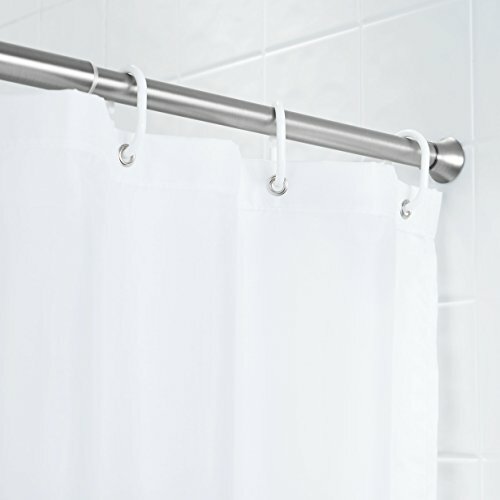 Amazon’s curtain shower rod comes in various color choices and offers buyers the option to manually adjust the length of the rod, adapting itself to its surroundings while also providing a solid enough grip. It seems like there are some uncommon issues with sizing when ordering the product though, as it appears that sometimes people received a shorter rod than the one ordered. The curtain is pretty light and might not hold as much weight as other products in the market but it works as intended and doesn’t provide much of a hassle during setup. The product might look and feel pretty cheap at first glance, but once installed properly it should make customers happy. The design looks good and properly suits most bathrooms – it’s ideal for tiled showers! Color choices allow owners to pick whatever tonality they require. The rod looks good and adapts properly to most surfaces, even rippled ones. It’s an AmazonBasics product, which usually assures good customer support in case anything goes wrong. Issues with sizing could make ordering the product a bit of a hit-and-miss task. Doesn’t hold much weight and it might fall under heavy pressure. 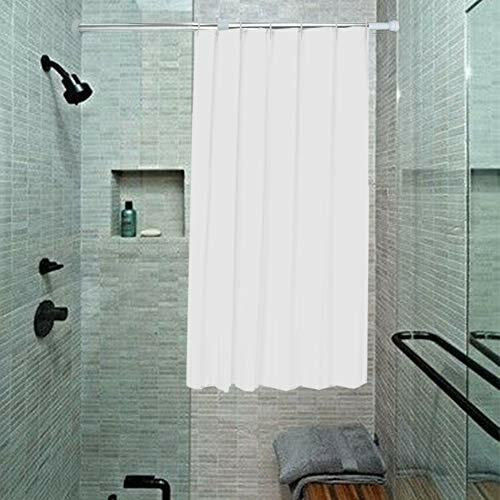 This shower curtain might be in the higher categories of pricing, but it does justice to the extra buck you’ll have to pay for it with its easy setup mechanism, along with its durable steel composition which allows a longer and rust-free lifespan. Although it should hold itself on its own when placed against the tile, you might need to utilize small amounts of Velcro on its edges in order to keep it from slipping. In any case, the product gives a high-end vibe and looks very good as a shower curtain or as a clothes hanger. It might sometimes present instances of rusting, but there shouldn’t be any issues in this regard even after months of usage. Made of steel, which helps it stay rust free even with constant water flow near the rod. Holds enough weight if setup correctly. Costs around 10$ more than the average product, though many consider it worth paying. The company doesn’t seem to be very receptive to complaints, which could prove to be an issue if something goes wrong with the purchase. There has been one documented case of rust, but it seems isolated and shouldn’t be taken as a given. The BEOKREU Tension Curtain Rod is perfectly safe to use, thanks to its lock-in-place tech that keeps it steady. Don’t ever worry about falls, bending, and rusting. Each rod can carry up to 20 lbs of weight. 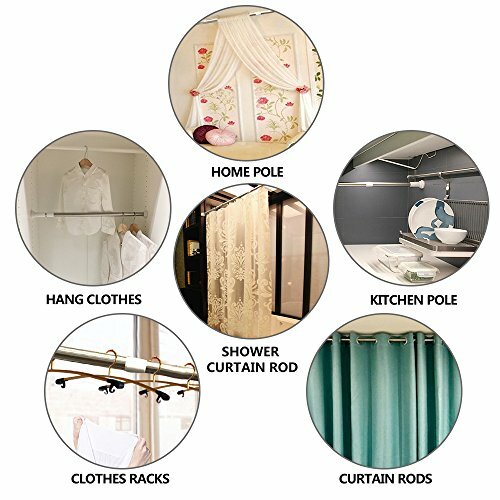 You can use it for more than your shower curtain: it’s also a good rod for blackout curtains, and as a laundry drying rack in the bathroom. It’s simple and easy to set up. All you have to do is pull it and lock it in place. No tools are required. The rubber ends are sturdy but soft grippers that keep the rod in place. Install it in mere minutes. You don’t need to drill holes in your bathroom or damage your tiles. For your reference, an instruction manual is also included. These tension rods work on most surfaces – tile, wallpaper, wood, smooth walls, and more. The spring-loaded tension keeps them steady and in place. The Casa Pura Tension Shower Rod is one of the most positively reviewed options on Amazon. You can adjust it easily to go longer or shorter, depending on your needs. Elongating it will not reduce its weight-bearing capacity. It is made of high-quality, durable aluminum with non-slip ends. It is also sophisticated to look at and will match your bathroom decor seamlessly. Because it is rustproof, you can use it for a very long time. To install it, simply hold the shower curtain bar level, then twist it until you have your desired length and the non-slip stronghold ends get a nice, good grip on your tile or wall. The installed spring loaded tension will keep it in place and you’re all set. Each bathroom is unique, even when it comes to size. That’s why the company offers various size options, so you can get one that is exactly what you need. All of them are adjustable. Choose from 22-25 inches, 28-48 inches, 41-79 inches, and the biggest is 55-98 inches. 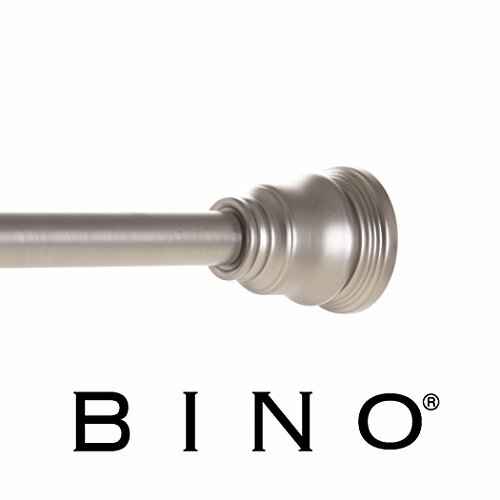 The materials used in making these shower rods use superior spring-loaded technology, keeping them steady and strong for a long time. GoodtoU Tension Rods are a popular choice in the market, and for good reason. These tension rods are equipped with quality rubber ends, which have caps that can be easily removed. You can slide your shower curtains in and then replace the end caps when you’re ready to install to the wall. It’s very easy to set up these rods. Just rotate the tube and place it as you prefer. You can lengthen the rods as much as you want, for maximum grip and stability. You can also use this for the living room and bedroom curtains. You can adjust the length of the rods. Do this by holding the rods at an angle where the left is higher than the right side. Tighten the rod. Slide the right side up. Tighten as you go. Screw and unscrew as you adjust the length to your preference. The company offers great customer service, which includes replacements for products which are unsatisfactory in any way. Simply call them and let them know. The KOP Tension Rod is very easy and simple to install. You don’t need to hammer nails or screw bolts into your tile or wall. It is very safe to use, too. It uses technology that keeps it in place and prevents it from falling off. 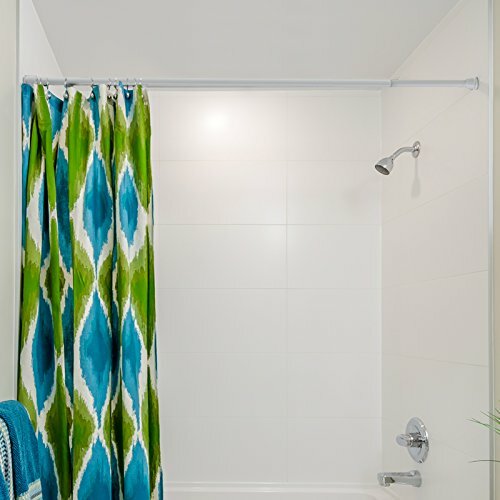 Shower without worrying about a wobbly or bent shower curtain rod. Its material is rustproof, so you can take daily showers and enjoy this item for a long time. The rod is made of thick stainless steel, which is durable and steady. The all-new patented technology, Constant Tension, makes this stand out from the crowd. It keeps it in place and gives it a strong and durable construction. You don’t need additional accessories or fixing to set it up. It has non-slip rubber ends that keep the rod in place. It doesn’t damage your tile, wall, or closet. With that said, you can use it in any area of the house: the bathroom, inside closets and cupboards, in the bedroom, in the living room, and even outdoors to hang your clothes on. It’s a great hanging rail for your wardrobe, too. 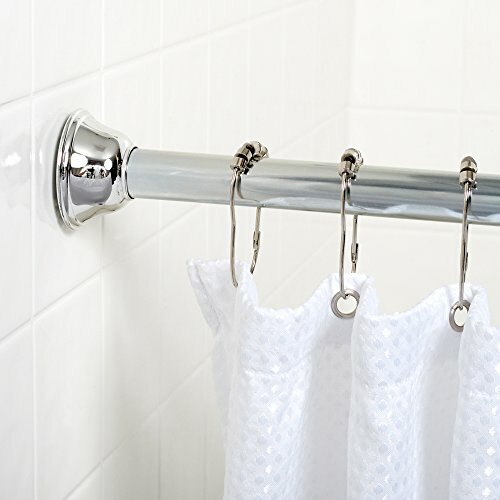 The Tension Bathroom Shower Curtain Rod by Zenna Home seems to offer the best value for money thanks to its inexpensive price and good enough quality that generally keeps it in great shape for a long time. It can also hold a decent amount of weight, so if you’re looking for a multipurpose product this might be your perfect buy! Remember to check our other bathroom product reviews if you’re looking to make improvements to your shower and its surroundings – we’ve gone over a fair share of commodities that could very well improve your everyday life!